As a freelance photographer, Sean Shaver covered Elvis at concerts and public appearances, as well as candidly, on a full-time basis from 1967 to 1977. During this time, Shaver estimates that he took 75000-80000 pictures. 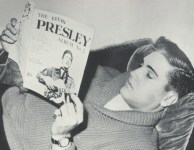 He is author of magazines and books containing (his) Elvis photographs. There existed a very interesting website about Sean Shaver maintained by Suza B. (www.seanshaver.com), but it dissapeared from the internet (last checked on 26 October 2017). The website was partly archived by www.archive.org, but some images were lost. 1977 - Elvis Presley: Softly... I Must Leave You ... The Last Few Months!